Welcome to my little girl's lavender abode. The completion of this nursery took me months, but after viewing numerous designer rooms, I think I came up with a space that incorporates all the things I love. 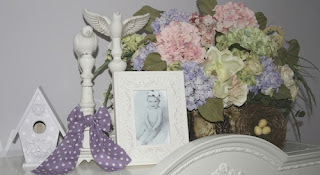 My inspiration for the room was the wall color: soft lavender. After painting the walls, I came to the conclusion, the room needed a focal point. So I decided to hand paint stripes in a gloss finish on the main wall (the wall you see upon entering the room). I think this added a subtle charm to this small space. My next order of business, was finding the perfect bedding. I found this task to be very difficult. I searched numerous department stores and always found myself empty handed, so I finally decided to search the web. To my surprise, I found the perfect crib set on Ebay. 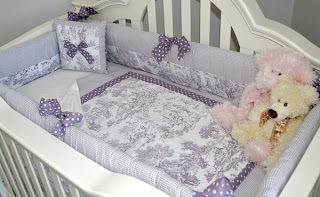 Beautiful lavender toile, with touches of gingham and polka dots. I couldn't be more happier with my selection! 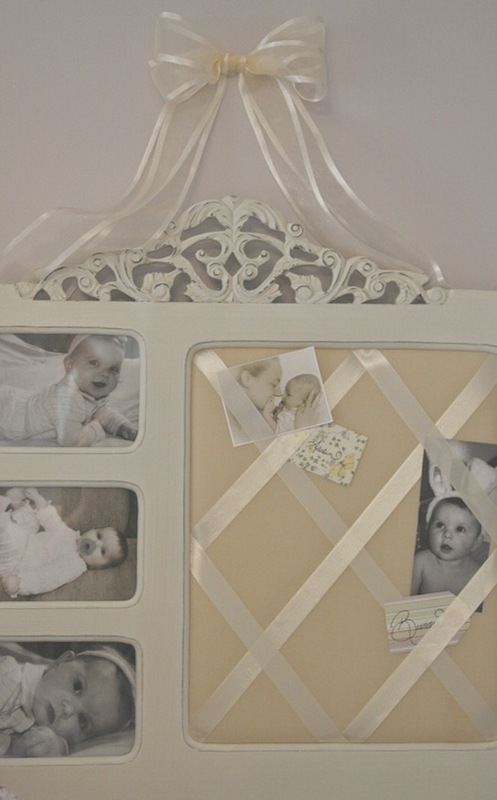 Throughout the nursery, I used touches of cream and ivory. I also embellished the room with bunnies and birds to give it a cozy cottage feel. I wanted to achieve a sophisticated, serene atmosphere, yet one that was young and cheerful. Please, Take A Tour . . .
For a special touch, I added a custom monogram. I found this sweet little memo board at Tuesday Morning, it's the perfect match to the roman shades. I couldn't resist these precious bunny bookends (an excellent Ebay find)! 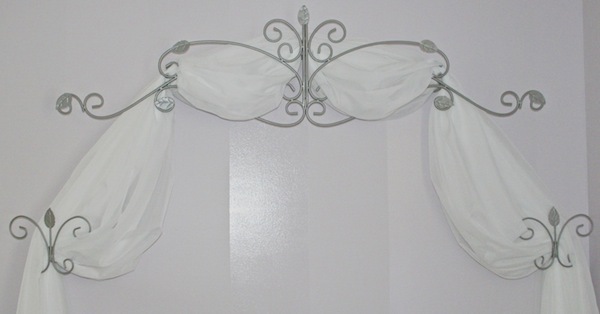 The iron work above the crib was originally brass, so I spray painted it satin nickel to match the window hardware. Where did you purchase that? I hope you enjoy this room as much as I do! I'll be joining Savvy Southern Style, DIY By Design, Someday Crafts and Elements Interiors for their Wednesday "Link" Parties! I'll also be attending, Debbiedoo's Monday Newbie Party, Somewhat Simple, Free Pretty Things For You, a' la mode & Evolution of Style. Beautiful room! Love the color! I'm in LOVE with this nursery. I have the same nightstand in my daughter's bedroom. I wish I had bought the armoire when I had the chance. 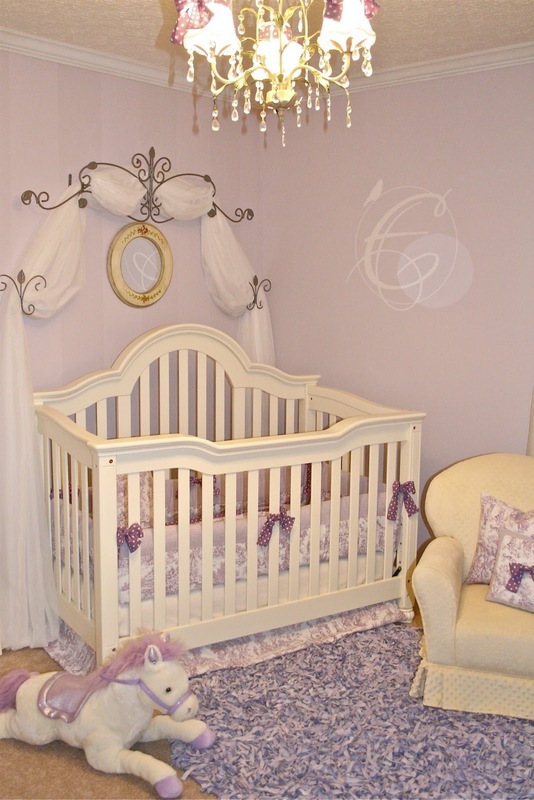 Everything is simply gorgeous in your nursery. I think this is one of my favorites. Thanks so much for linking up to the party. Such a beautiful and elegant nursery, I love it! Oh be still my heart! This is sooooo gorgeous! My daughter's room is done in yellow toile so you sucked me in right away with that. :-) You have done a fabulous job and it looks like something right out of a magazine! I think this nursery is so pretty. 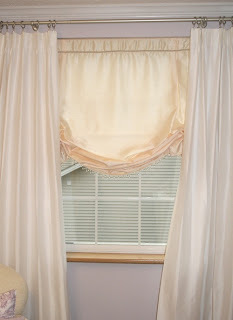 I love toile and lavendar so the combination is great. Very elegant and feminine but not too babyish. 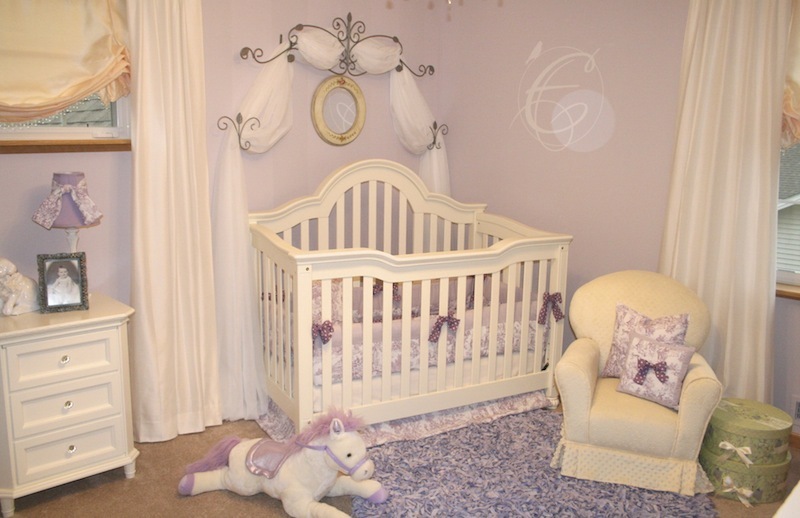 I just *knew* Vanessa would already have commented on this fabulous nursery! Oh my it is GOR! GEOUS! The monogram on the wall is ingenious but I am in LOVE with the chandelier! Good job Jodie! Good job! What an adorable girly nursery. I love it and you have thought of every little detail to make it special. Nothing better that toile. Thanks so much for sharing this at my party! This room is so calm, cute and crazy beautiful! Fantastic job decorating in such an upscale way. Stunning! This is beautiful! I really love all of the vintage touches! OMGosh! The most fabulous nursery I have seen! Great job! What an absolutely beautiful space! I adore the color...every single detail is perfection! LOVE! PERFECTION!!! Thank you for likning this up at Whassup! Im FOLLOWING YOU :) Please come back every Wednesday! what a lovely nursery for you new little one as well as you to enjoy late night feedings in. Love everything! It was great that you included a where to find it list. =) Beautiful! Wow, this is gorgeous! The light purple is so pretty for a little girl. I love all your DIY and little accessories! Looks so pretty-like out of a magazine. Happy Weekend. I love the colors, and really love those bunny bookends! Beautiful!! I love it all! 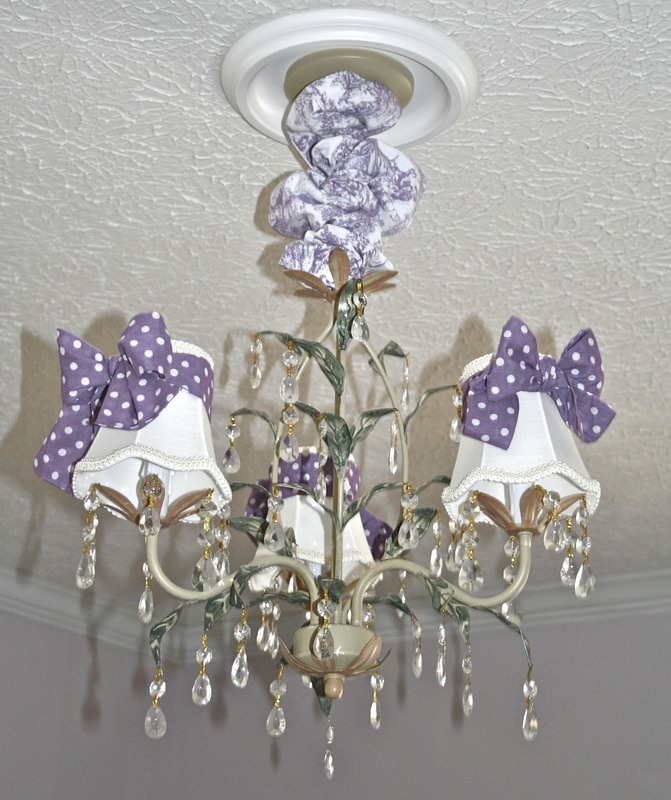 The chandelier is especially precious, she is a lucky little girl! What a beautiful room, your daughter is one lucky girl! You really have thought of everything in there. I love the bows on the chandelier. :-) Thanks for linking up! What a beautiful room! You have such an eye for detail. Love your blog! I love all the great ideas I've seen on your blog! I'm awarding you one of my Stylish Blogger Awards. 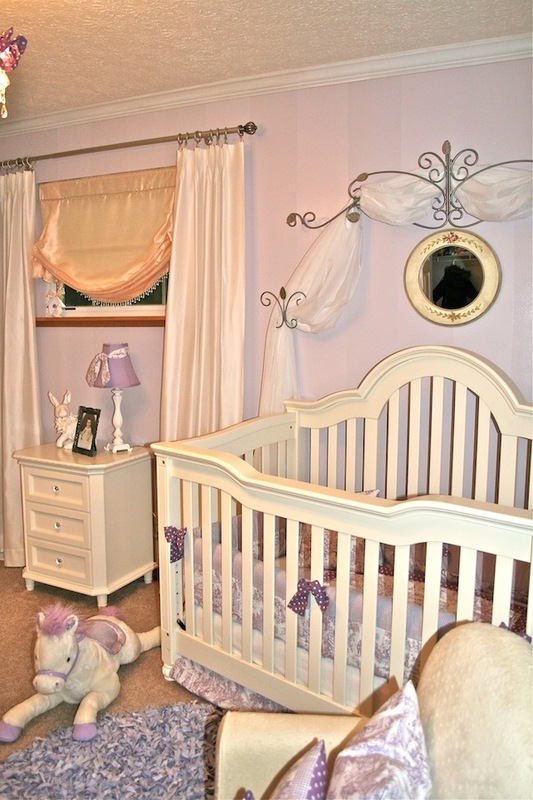 What a very pretty nursery - just perfect. You did not miss any detail. Absolutely precious! I just had the pleasure of decorating a nursery for my new baby boy. So much fun! It's beautiful! Thanks for sharing! Just gorgeous! I'm forwarding your link onto some of my preg friends... such good ideas, well done. Thanks so much for joining me. I would love if you added my link as well, so that others know about the "newbie party"
I LOVE what you did with her room, just precious! I esp. love the what you did behind the crib! Fabulous job! Absolutely stunning! 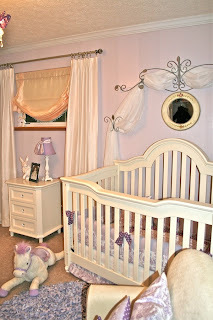 I love all of the little details; a beautiful nursery! This is precious! Love the purple. Just found your lovely blog via Debbie's Newbie Party. I'm your newest follower and would be delighted to have you follow me back! This is so adorable! You had me at lavender -- a favorite color. Holy Cow!!! This is so beautiful, I want to sleep there! That has to be the most beautiful nursery I've ever seen. Just gorgeouss!! I'm here from Debbies party, and I'm also your newest follower! Jodie your blog and entire home are simply wonderful. I'm going to follow along and add you to my blog roll. Gorgeous inspiration! I'll be back often. Come by and say Hello anytime. Very pretty! I am probably partial because I am just starting a lavender nursery myself! My little girl isn't due until June, so I just got started. I'm doing black furniture though. 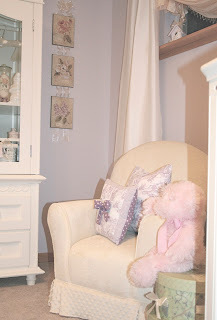 Congratulations on your beautiful nursery and your little girl! I featured your gorgeous nursery from last week's party. Please stop by and pick up your "I've been featured" button. thanks. So sweet, what a beautiful job you've done. Thank you everyone for your kind words! This nursery truly was a labor of love! I'm so delighted you enjoyed it! Thank you Savvy Southern Style & DIY by Designs for featuring this post! It means so much to me! I also want to thank Nest Nesting Nested for awarding me with the stylish blogger award! Beautiful! Makes me wish my girl was itty bitty again! LOVE all the details you put into this room!!! Such a gorgeous space you have created, you didn't miss anything! I love it!!! Thanks for your visit, beautiful blog! Gorgeous! It's got such a Victorian feel to it. So pretty. I Love the little bulletin board with the ribbon on it! 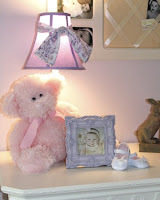 This is the cutest little girl's room that I've ever seen! I have 2 boys, so this girly thing is so awesome to see! I found you through Debbiedoo's and am now a follower. I would love for you to come check out my blog as well! You are one awesome decorator! This is one beautiful room. I am 70 yrs old but would you adopt me? I want a room just like this. Just beautiful, I like every element. What a lovely girly room...so sweet and I'm sure you are proud. omg that is too beautiful! i don't have babies yet, but when i do, this will be a definite source of inspiration! Adorable! Love the colors. I am a new follower and I would love if you came and followed me back at A Sew Chic Boutique! Simple and beautiful! LOVE LOVE LOVE IT!! Awesome Job! 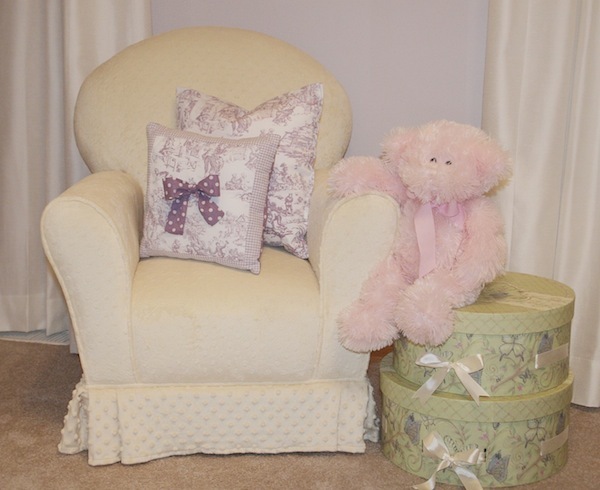 This nursery is oh-so-sweet! Great color and I love the toile. It's just so timeless and classic. I used green toile in the curtains for my daughter's nursery in our old house, and even as she grew older, it grew right along with her. :-) Thanks for linking up to Room Evolutions! What a beautiful room! The color scheme is gorgeous. 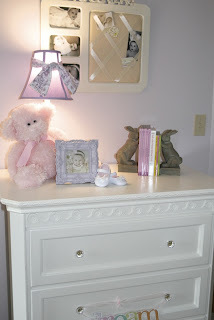 This is the sweetest baby girl room I have seen in a long time! You did an awesome job! This is exactly what my sister wants to do for my niece! We are sticking out on finding the bedding. Any ideas? 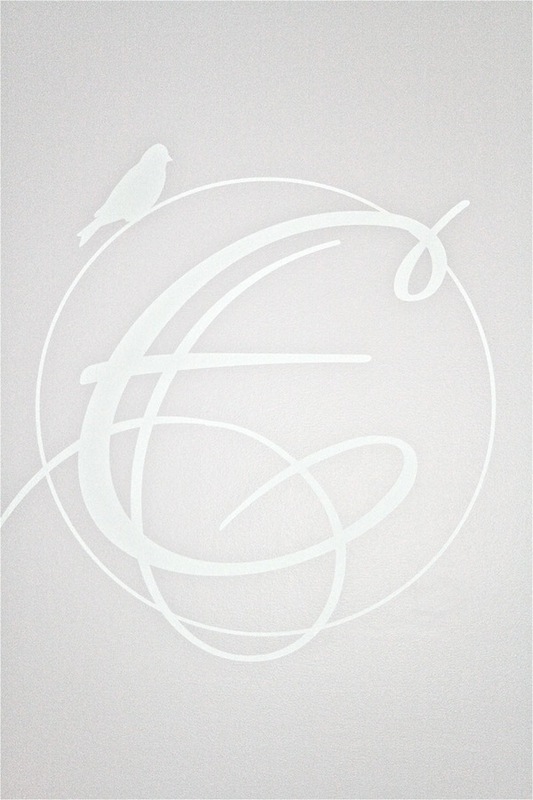 Copyright © 2011-2014 Love, Laughter & Decor, All Rights Reserved. Simple theme. Powered by Blogger.